This Birthday Spiral or Advent Spiral creates a special atmosphere on each occasion: for birthday tables, for decoration on a window-sill and on the nature table in christmas time. Because of its 24 holes one can use it as a advent calendar. Light up a candle on every day, or let a candle go from hole to hole. Decorate it with our Decorative Figures, the little vase (04700/04760) with flowers and candles. You can also form it like a wave or simply use only one part for decoration. 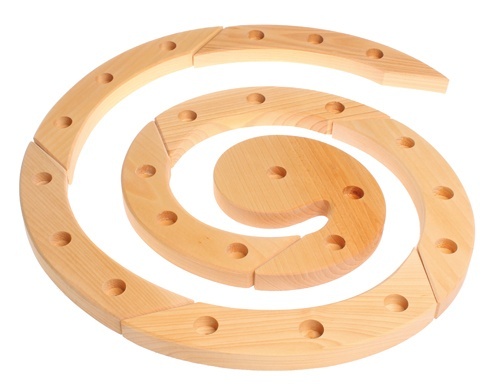 8 pieces, on each are three holes. 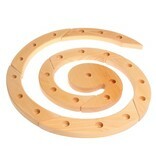 Wooden Ring Materials: lime wood, non-toxic plant-based oil finish. Diameter 40cm. We recommend the Brass Candle Holders (#04800) for the candles.